This post is entirely in dedication to Miss Harvey whose status the other day reminded me of terrific summer bike escapades. Merci beaucoup for the wonderful though, now for the imagery. These are courtesy of Hoss Intropia, an adorable Spanish clothing line, these photos are from their summer catalogue. 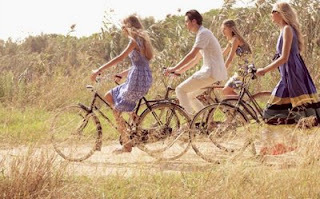 I am going to pretend that biking with Miss Harvey, possibly in her home town would resemble something as, if not more whimsical then what these lovely people are portraying. The best part of this? It is currently lightly snowing outside my window. Sick le. keep it breezy, m. p.s if anyone has a sweet, slightly vintage bike let me know as Miss Harvey is on the look out.